This is a robust blueish-green grass with a thick spiky head of florets. 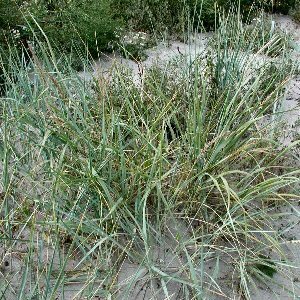 Rare, but increasing, on the upper parts of sandy beaches, associated with the zone of couch-grass (Elytrigia repens). Its increase over the past thirty years may be linked to a warming-up of the climate of the Irish Sea basin. All names: Leymus arenarius (L.) Hochst. 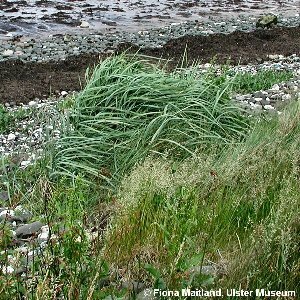 ; Elymus arenarius L.